Sweet Potato ( Ipomoea batatas, CONVOLVULACEAE ). 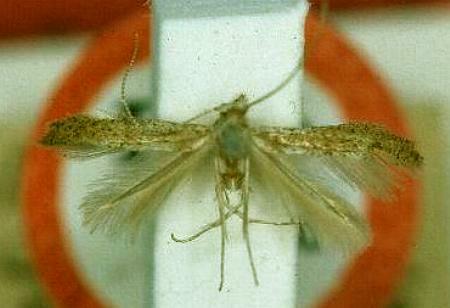 The adult moths have pale brown forewings stippled with darker brown. The hindwings are fawn. There are fawn fringes of hairs on the trailing edge of each forewing, and around the whole of each hindwing. The antennae are nearly as long as the forewings. The moths have a wingspan of about 1 cm. Volume 9 (1972) p. 240.